Svetambara compound is visible on the right while Digambara compound is on left. 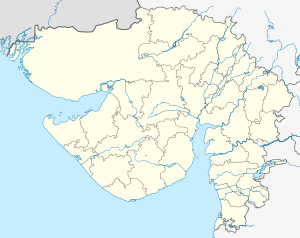 Taranga is a Jain pilgrimage center near Kheralu in Mehsana district, Gujarat, India. The oldest Jain temple constructed in 1121 by the Chaulukya king Kumarapala, under the advice of his teacher, Acharya Hemachandra. The Svetambara compound consists of 14 temples in all. There are also five other Digambara-affiliated temples at Taranga hill. The place was historically associated with Buddhism and the monuments dated to 4th-8th century are found here. Taranga became important Jain pilgrimage site after 12th century. In Kumarapala Pratibodha of Somaprabhacharya, composed in Vikram Samvat 1241, states the local Buddhist king Veni Vatsaraja and Jain monk Khaputacharya had built a temple for goddess Tara and thus the town was named Tarapur. The hill for the most part covered with brushwood and forest is, on the east and west, crossed by road that lead to a plateau where stand the temples built of white sandstone and brick. The main temple was built by Chaulukya king Kumarapala (1143 - 1174) after he became follower of Jainism under his teacher Acharya Hemchandra. In the center of the main vast square of the length of 230 ft and the breadth 230 ft (70 m square), this temple is 50 ft long, 100 ft broad and 142 ft high (15 m by 30 m by 43 m). It has a perimeter of 639 ft (195 m). The 275 m (902 ft) high wooden summit of this temple is beautifully carved. It has seven domes. It is hard to see how the stones were ever brought through the forest to the top of the hill. The red interior of the temple throws out in strong relief the 2.75 m white marble figure of Ajitnath, the second Tirthankara seated in the shrine, decorated with precious stones let into the marble. The features wear the usual expression of deep repose or quiet covert scorn. On the right hand side of the temple, there are footprints of Rishabha and of the 20 Tirthankaras and on the left hand side, there are a temple of Gaumukha, the Samavasarana, and the Jambudvipa painting. On the outer platform of the main temple, there are idols of Padmavati and Kumarapala himself. The special times of pilgrimage are during the full moon in the months of Kartika and Chaitra (November and April). In the adjoining shrines are various images. In one is an upright block of marble with 208 representations of the Tirthankara. Digambaras settled on this isolated hill with its three rocky peaks in early times. It is said that 35,000,000 monastics, including the Ganadharas Varadutta and Sagardutta, attained moksa here. The two hillocks named Kotishila and Siddhashila have shrines with idols of the Tirthankaras, Neminath and Mallinath dated Vikram Samvat 1292. There are 14 Digambara temples in the foothills and a Digamabara rest house is at the foothills. On the highest elevation of the three-peaked hill, there stands a "Tonk", a shrine built by Digambaras, it houses a marble statue of the nineteenth Tirthankara, Mallinath. The earliest archaeological were reported in 1938. The place was historically associated with Buddhism when Vadnagar was also under Buddhist influence in 4th-5th century. The Taranga hill bears the name of Taringa or Taranga, probably from a shrine of Taran Mata. About 2.5 km north of the hill, the shrines of Taran Mata and Dharan Mata is situated near a natural stream. These shrines are built on high platform. The idol of local deity Taran Mata in the shrine is of Buddhist deity Tara originally. There are other Buddhist statues including Avalokiteshwara Padmapani there. The idol of Taran Mata is dated to 8th-9th century based on its style. The construction of the right side of the stream is probably an altered Buddhist stupa. Two large-sized terracotta images of Buddha were found here in the past which were dated to last quarter of the 4th century based on their style. There are also ancient cave shelters. Nearby cave, locally known as Jogida ni Gafa has a relics of four Buddhist statues known as Dhyani Buddhas under the Bodhivriksha. The cave was used by Buddhist monks years ago. Wikimedia Commons has media related to Taranga Jain Tirth. ^ a b c d Susan Verma Mishra; Himanshu Prabha Ray (5 August 2016). The Archaeology of Sacred Spaces: The temple in western India, 2nd century BCE–8th century CE. Taylor & Francis. p. 66. ISBN 978-1-317-19413-2. ^ a b c d Gazetteer of the Bombay Presidency: Cutch, Palanpur, and Mahi Kantha 2015, p. 442. ^ a b Rajnee Vyas (2006). Welcome to Gujarat. Akshara Prakashan. p. 69. ^ "Taranga". Gujarat Tourism. Retrieved 29 July 2016. ^ "Buddhist Caves, Taranga Hills, North Gujarat". Gujarat Tourism. Retrieved 29 July 2016. Gazetteer of the Bombay Presidency: Cutch, Palanpur, and Mahi Kantha. Government Central Press. 1880. p. 442. This article incorporates text from this source, which is in the public domain.